As of this date, there is no one serving as Events Committee Chair. Because of this, the Board of Directors will need to take the lead in setting a time and place for Spring Meeting at the next Annual Board of Directors meeting, which is held each February. Of course, a special Board of Directors meeting can also be called. One of the propositions to be posed for a vote will be about the Spring Meeting. We have an offer from member Terry Shaw. He has invited us to use his sugarhouse facility at the Visions of Vermont Art Gallery in Jeffersonville. We held a Spring Meeting there in the past and it proved to be both economical and convenient for a meal and a covered bridge tour. We have also held an annual meeting at the Vermont Covered Bridge Museum on Gypsy Lane in Bennington. They have a very good conference room and other conveniences. Arrangements for dining would have to be made. The 2015 Fall meeting was called to order by VCBS President Bill Carroll at 10 AM with twenty-three people in attendance, including representatives of the Lamoille Valley Rail Trail who had a display of their activities and brochures. Minutes of the Spring meeting were not read as they are published in The Bridger. Neil Daniels reported the following balances as of August 31, 2015. Editor needed for The Bridger. Duties are to collect articles for The Bridger four times per year. There is no need for the editor to be a Vermont resident. Terry Shaw addressed the issue of vehicular traffic on the newly reopened Poland Bridge. Because of the proximity of the rail trail, the uniqueness of the bridge, and the difficulty in enforcing weight and speed limits, attempts are being made to have the Cambridge Selectmen close the bridge to all motor vehicles. Jan Lewandowski and Neil Daniels spoke on some of the aspects of the bridge reconstruction. A number of archival collections relating to non-Vermont covered bridges, as well as duplicate materials, were delivered to the repository at Oxford N.Y. In accordance to a vote of the Board of Directors. Warren Tripp reported on the status of the library - some 75 books and pamphlets are available to be loaned to members. Contact Warren for further information. Events Committee: No report (due to the unexpected hospitalization of Bill McKone). At present there are 140 members, of which 80 are in arrears of their dues. Please contact Joe at jcnelson@together.net We depend on our dues for our operating funds. We welcome new member Laura Trieschman of the Vermont Historical Society (our guest speaker for the program today). Deferred to a later date. A date and location for the next meeting was not set. Being no further discussion, the meeting was adjourned at 10:50. The program at 11 AM was a talk given by Ms Laura Trieschmann, Vermont Historic Preservation Officer, entitled A Bridge is a Curious Thing to Cover. A contractor has begun a nearly $2.2 million, 14-month rehabilitation project designed to restore pedestrian access and ensure long-term preservation of the 145-year-old Scott bridge (WG#45-13-13). The bridge has been closed to pedestrian traffic since early 2012. It has been closed to motor vehicles since 1955. A 2012 engineering report by Hoyle, Tanner & Associates listed numerous problems including trusses that were in "imminent failure condition." A "no-build" alternative, the report said, "would not prevent further deterioration, which could cause eventual collapse of the covered bridge into the West River." Emergency stabilization work performed later that year kept Scott Bridge standing and extended its life until money could be found for further repairs. 81 percent of the cost will be covered by federal funding, with the remainder coming from the state. Vernon-based Renaud Brothers Inc. was chosen for the job. The company has extensive local covered-bridge experience, having worked on the Dummerston bridge as well as Brattleboro's Creamery Bridge. Construction is underway with completion scheduled for the end of 2016. The initial portion of the project - insertion of steel beams - will support the structure during the project. The work that will follow includes installation of a new roof, a lighter deck and replacement of lattice that is "split or rotten or cracked". Rehabilitation work on Brown CB is complete: roof repairs, new siding and runners, masonry rebuilding and repairs, truss repairs. On Tuesday, September 29th, heavy rains along the east coast caused the Smith River in Patrick County Virginia to rise well above its normal level. The resulting surge destroyed the Bob White covered bridge (World Guide #46-68-01). Jack's Creek bridge, less than a mile away, survived the flood. The Bob White bridge was built in 1921 by Walter Weaver. It was added to the National Register of Historic Places on May 22, 1973. Patrick County had recently received approval from the Virginia Department of Transportation to restore the bridge, which was beginning to shift slightly and was no longer safe for vehicles. It is not known if that money can be put towards construction of a new bridge. Last quarter I informed you of a report I filed with the Bennington Police Department after witnessing a dump truck crossing the Henry Bridge (45-02-02#2). Shortly after the last Bridger went to press, I received a letter from the chief of police stating that they were able to identify both truck and driver from the information and photographs I provided and would take the necessary action. If you witness a potential threat to one of our covered bridges, be sure to contact the appropriate authorities. * * * Return to top The Blenheim Covered Bridge to be Restored! They said it wouldn't happen. It wasn't long before the articles hit the press after FEMA approved funds to replace the Blenheim Covered Bridge. Though a replica of the original historic icon may not ever be put on the National Register of Historic Places right away, the sentiments and beautifully unique long and double arch truss system will be like the return of a long lost friend. The Blenheim CB was the longest single span wooden covered bridge in the world. It was originally built by Nichols M. Powers in 1855. Chairman, Don Airey of the Blenheim Long Term Community Recovery Committee (BL TCRC) has been the squeaky wheel and persistent force behind the battle to have the covered bridge replaced following it's being wiped out by Hurricane Irene. Bill Cherry, Schoharie County Treasurer, chairs the countys Flood Recovery Committee stated that the project will not cost county taxpayers, with the state picking up 25 percent of the tab and the federal government funding the remaining 75 percent. Architectural and engineering design work for the Blenheim CB project was done by Greenman-Pedersen Inc. (GPI) only with FEMA. The replica will sit on new abutments, 15 feet higher than the original bridge, in order to mitigate its loss to another flood. Although it is not a fixed cost, it is expected to be a $5.8 million project. Don Airey was quoted as saying, "if the bridge is taken at 15 feet higher, we are all in trouble," as stated in the September 17, 2015 article in The Mountain Eagle. In a conversation with Mr. Cherry recently, he said that they would like to utilize some of the artifacts found in the debris after the flood but much has been compromised. Hope is that some of the hand hewn hardware may be incorporated or a few of the recovered wooden members or signage but it all remains to be seen and surely nothing will be used that would compromise the integrity of the replica. They have recovered a stack of debris the size of a small house which remains under cover and then some that remains outdoors. It is anticipated that bids could go out by late spring or early summer of next year. In late September, the Cambridge Junction bridge (WG #45-08-02) was reopened to vehicular traffic for the first time in many years. It was believed that the bridge was to be closed to traffic permanently. The Cambridge select board was concerned that one of the conditions of a recent repair grant was to keep the bridge open year round. Initially, a meeting had been scheduled to discuss the possibility of opening the bridge to traffic. However, the barricades were removed before that meeting took place. As of November 30th, it was still open to traffic although it appears that it is being prepared for winter snowmobile traffic. During the winter, an extra layer of wood is added to the deck to allow snowmobiles without damaging the permanent floor. While it is nice to see the bridge being used for its original intent, we are not aware of any engineering studies to confirm the vehicle load capacity of the structure. 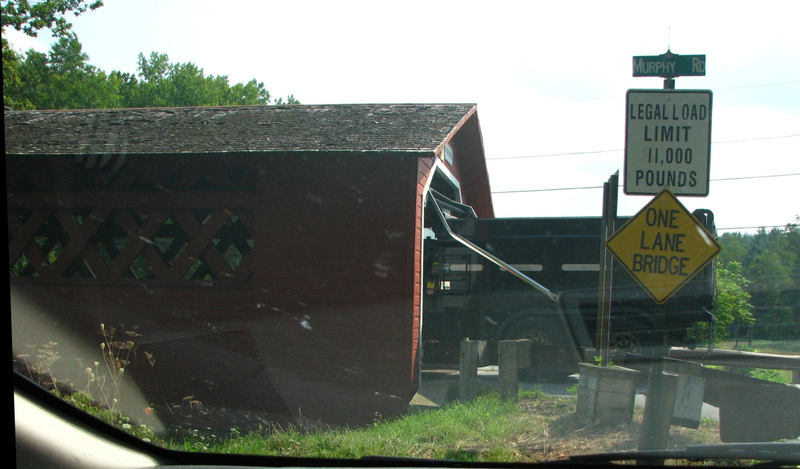 As with all our historic covered bridges, carrying vehicle traffic includes the potential for an overweight or oversize vehicle to attempt to cross. Presently, there are no physical barriers to deter oversize vehicles from entering the bridge. With an alternate route right near the bridge, there is no inconvenience to the travelling public by having the bridge closed. We will watch the situation through the winter and plan to provide an update in the Spring edition. a Collection of Good "Reads". Some pretty darn good reads are available in our lending library for covered bridge fans. When I’m exploring the bridges, I like to know something about their history and what makes them work: it adds to the pleasure of the visit beyond the photos I bring away. If you haven't read author Eric Sloan, you're in for a real treat. He takes us back to the days when the covered bridges were new and the tools used to build them were the "state of the art." Our library is also graced with the works of the dean of covered bridge explorers, Richard Sanders Allen. 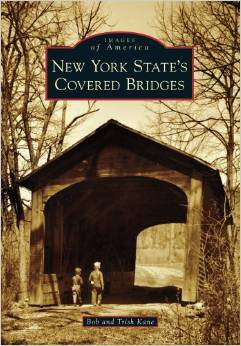 For Vermonter's, his Covered Bridges of the Northeast is a must read. 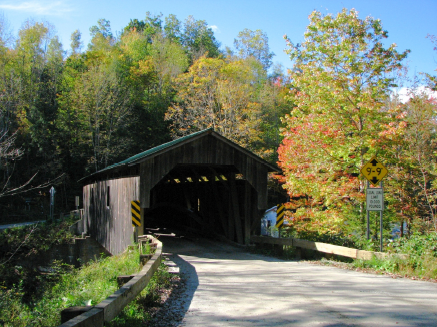 Ed Barna's Covered Bridges of Vermont, and Joe Nelson's Spanning Time, Vermont's Covered Bridges are also available. If you are into haunts and spooks, borrow our copy of Herbert Congdon's The Covered Bridge. He not only tells us about Vermont's bridges, but the inside story of Emilie's Bridge and how the Gold Brook Bridge in Stowe came to be haunted. Our lending library is available to all Society members-in-good standing through media mail. If you have some books you'd like to share, we'd love to add them to our library. Contact Warren Tripp, P. O. Box 185, Barre, VT 05670, fftwbt@yahoo.com, Phone (802) 476-8637. The Historic American Engineering Record (HAER), a division of the National Park Service (NPS), Heritage Documentation Programs, announces the publication of Covered Bridges and the Birth of American Engineering, edited by Justin Christianson and Christopher H. Marston. 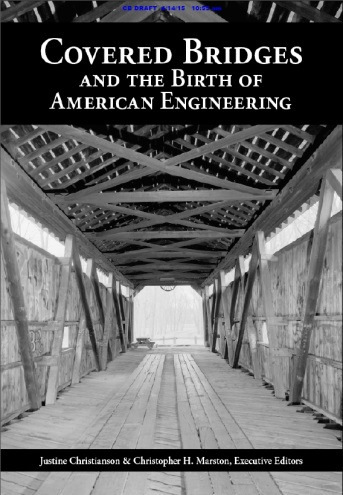 This book examines the development of wood trusses and covered bridge construction, profiles the pioneering craftsmen and engineers involved, explores the function of trusses in covered bridges, and looks at the preservation and future of these distinctly American bridges. The editors have collaborated with some of the leading historians and engineers of historic covered bridges in the country to produce this volume. HAER is distributing this publication to members of the covered bridge community nationwide. We should have copies available for the Spring meeting. Additional copies may be requested while supplies last, by contacting Christopher H. Marston at christopher_marston@nps.gov. A PDF version of the book, along with other related NHCBP publications, is available electronically through the National Center for Wood Transportation Structures, at www.woodcenter.org. The Communications Committee is considering an upgrade to our website: www.vermontbridges.com. While planning what features will be retained, we are asking for suggestions from the membership for new features. Send your suggestions to me. The Society will not be asked for financial support for making the upgrade. Our webmaster Steve Miyamoto will carry out the work. Wendy Payson, Steve Miyamoto, and I, have teamed to improve the VCBS brochure that has been in use almost since our founding. The text has been simplified and a QR address has been added to access the society website for prospective members with smart phones. Anyone wanting the new brochure can contact me at jcnelson@together.net, or Wendy Payson at wpayson@gmail.com. The Gifford Bridge (WG #45-09-03) in East Randolph was originally constructed in 1883 as a multiple Kingpost truss boxed pony bridge. It was covered in 1904, when a second multiple Kingpost truss was added above the pony truss. It was once painted blue, but has been red for many years. Prior to 1955, it was reinforced with two steel beams above roadway tie-rodded to smaller steel beams under deck to strengthen the structure and increase its load capacity. The bridge was listed on the National Register of Historic Places on July 30, 1974. Happy Thanksgiving my fellow covered bridge enthusiasts. I am sure you are all aware of the terrible loss to the covered bridge world that was felt as the Blenheim Covered Bridge in New York was swept away by Hurricane Irene several years ago. We had one of the enthusiasts for the rebuild at our dinner explaining to us the process of obtaining the over 5 million dollars that has been allocated to rebuild it. The people of Schoharie County have been, for the most part, taken care of so this money is not coming from support money for the community. I have a favor to ask of you. I would like Arnold Graton to be able to work on the restoration of this bridge. It is supposedly going to be an exact replica, not being historic, but authentic. I have just seen in September the work that Mr. Graton is so capable of doing and he did work on Blenheim in the past. If they genuinely want it done as an exact replica I feel he is about the best there is in the field. If you have firsthand knowledge of what Arnold Graton has done, or have seen his work, or even just like the guy, can you possibly send a letter of recommendation to the 2 people I have included in this letter. I feel there could be no better tribute to this great bridge, nor to Mr. Graton, then by having him rebuild a replica, as accurately as humanly possible, for present and future covered bridge enthusiasts to enjoy. Thank you so much for your help and can you cc me if you are able to help us out with this. We host two meetings each year, the Annual Spring and Annual Fall Meetings throughout the state. The public is invited to attend. We have Standing Committees to do our work, each committee chaired by a member of the Board of Directors. However, some of the committees are not chaired, and other committees, while chaired, have no members. Much of the work listed above gets done, much of it is neglected due to the lack of members to carry it out. A list of our needs follow. Because over half of our members reside outside Vermont, committee members communicate by email, phone, and letter. None of the committee positions require residence in Vermont. Needed: Committee members for the VCBS Standing Committees, i.e. Bridge Watch, Events, Historical, Membership, Communications, & Publicity. Also known as West Hill Bridge, this 59 foot lattice truss bridge over West Hill Brook was built in 1883 by the Jewett Brothers. Today the area is remote and largely wooded, but in the 19th century there were numerous farms in the area (one owned by the Jewetts), as well as a creamery by the bridge, the remains of which are at the northeast corner of the bridge. To add to the attractiveness of the area, there is a natural waterfall below the bridge. Creamery Bridge is located on a crossroad that runs between the two roads that parallel West Hill Brook, one on either side, about two and one-half miles south from Vt. 118. The road through the bridge is likely to be impassable during winter months and mud season. In our archives we have several photographs and prints of the bridge from around 1980 to 2000, as well as newspaper prints from 1970, and two undated (probably 1950s) snapshots. Also known as Harnois Bridge, this 85 foot lattice truss bridge was built across the Trout River by the Jewett Brothers (Sheldon and Savannah) in 1863. The bridge is located on Longley Bridge Road nearly at its terminus on Vt. 118 in Montgomery in an area that is predominantly farmland. In our archives we have a number of photographic prints dating from around 1970 to 2010, as well as a snapshot of the bridge probably from the 1950s. This 77 foot long lattice truss bridge across the South Branch of Trout River was built in 1883 by the Jewetts, Sheldon and Savannah. Although today the area is wooded and the road leads to a dead end at a dwelling, this was a busy little industrial area in the 19th century. Beers Atlas maps of ca. 1870 show a number of mills along the South Branch; even the USGS topographic map of 1925 (surveyed in 1922/23) show buildings and roads no longer in existence. About the only remains of the historical past are foundations of a butter tub mill in the woods. There is a small waterfall beneath the bridge. The bridge was in poor condition some years ago but was repaired and restored after 2000. In our archives we have photographic prints of the bridge from around 1900s to 2000s, as well as a snapshot from probably the 1950s. MONTPELIER - If anyone is planning to collect covered bridges for a hobby he better get going. They are getting rare; If not valuable ... the State Department of Highways reporting today on its new map that there are only 168 in Vermont. Of these, seven are railroad bridges, 157 are on public highways, and four are privately owned. In counting its bridges, the department chalked up one half each for the six which span the Connecticut River between Vermont and New Hampshire. 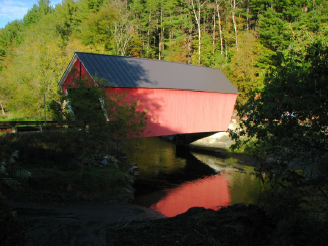 Best hunting grounds for covered bridges are Lamoille County, 19 highway and four railroad bridges; Washington County, 19 highway, one railroad, and two private bridges; and Windham County, with 20 highway bridges. MONTGOMERY - For a quick look at a nest of them go to Franklin County, the Department advised. Montgomery has eight, topping all Vermont towns. Runners up are Lyndon, Cambridge, Rockingham, and Weathersfield with six each: also Thetford, Tunbridge, and Northfield with five each. 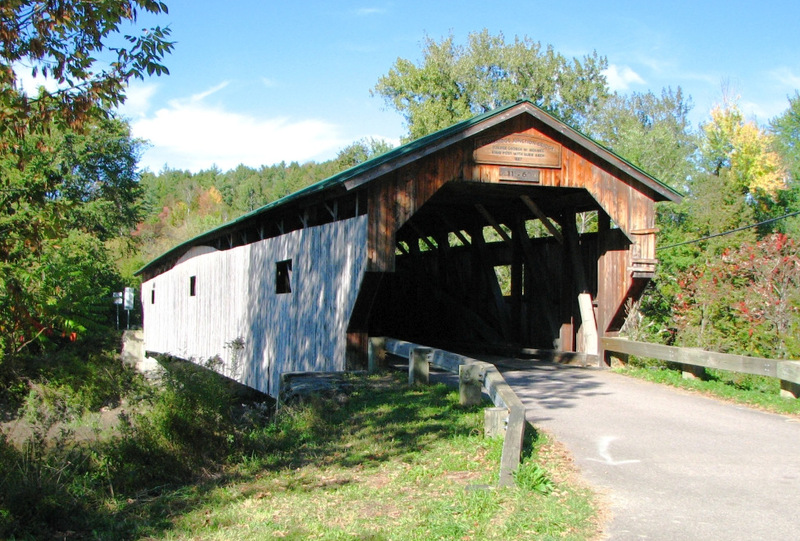 Commenting on the apparently high mortality rate among covered bridges, Commissioner Hubert E. Sargent stated that the Vermont Highway Department has made it a policy to retain as many as practical from an engineering standpoint. He said that generally the old wood highway structures are totally unsafe for modern fast, heavy traffic, and that undoubtedly the ones on main routes will have to be replaced. Middlebury - A book so rare that the Publisher searched two years for a sample copy to show to his printer has been issued in a new edition by Vermont Books; published in Middlebury. "The Covered Bridge" by Herbert Congdon, an entertaining and informative tour of covered bridges in Vermont, which has become a collector's treasure, will once again be available in a handsome third edition. "The Covered Bridge" is illustrated with 100 photographs of Vermont covered bridges and provides the best pictorial record and technical study of Vermont covered bridges ever made. The photos and illustrations were done by Edmond Homer Royce, a resident of St. Albans. The book takes readers on a county by county tour of Vermont presenting the various bridges with interesting anecdotes about construction and how these bridges have figured in the lives of early and contemporary Vermont residents. Of particular interest is the longest covered railroad bridge in Vermont which spans the Missisquoi River in Swanton. The Otter Creek bridge in Cornwall-Salisbury leans like "Pisa's Tower" and has become a unique attraction. The author discusses unusual bridge signs, one of which reads, "2 dollars fine for crossing this bridge faster than a walk." This edition of the "Covered Bridge" has been published by Vermont Books in response to an ever growing demand. The book was first issued in 1941. According to Robert Dike Blair, owner of Vermont Books, it was necessary to borrow a copy of "The Covered Bridge" from a friend in order to show the printers the design and style desired. The author, Herbert Wheaton Congdon, is both an architect and photographer. He designed his own home in Arlington and created the first maps of the Long Trail. Clarendon - At least one of Vermont's famous covered bridges is to be preserved as long as the elements will allow and man will permit. Clarendon selectmen anticipate that with good weather repairs on the covered bridge on the road to Boyd's orchard will be completed in about three weeks. Work has been underway since Oct. 2, but has been delayed during the past week because of bad weather, according to Leland Congdon, first selectman. The repairs are being made under the direction of the state highway department, but are being paid for by the town. A total of $5000 is already available for the work. Mr. Congdon does not know whether $5000 will be enough to finish the bridge, since only one end is torn up and workmen cannot tell yet in what condition they will find the rest of it. Thus far they have found the structure in much worse shape than they thought, Congdon said. On the southwest corner, only one foot of the 12l-foot span was holding on the abutment. 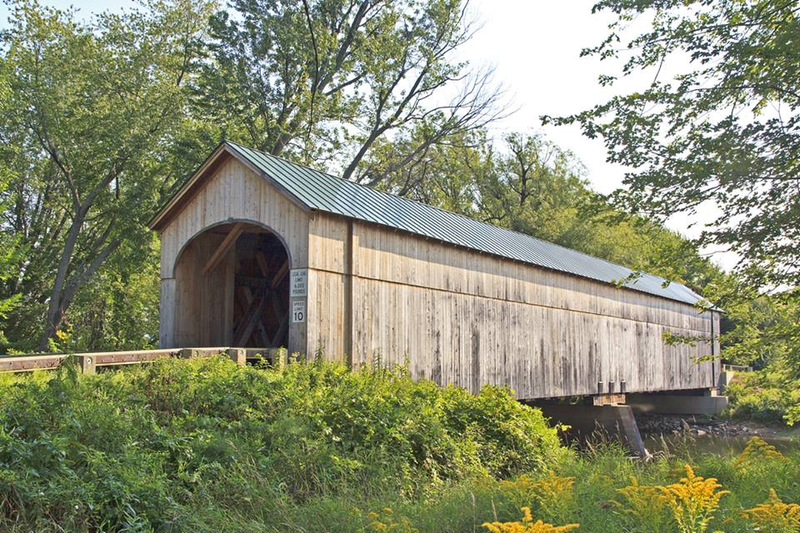 I am pleased to be elected as chair of the Vermont Covered Bridge Society's membership committee. I have always loved covered bridges and have been a member of VCBS for a couple of years now. I have been involved in membership activities in the past and had to take a step back due to health issues in my family. I'm excited to once again have the time to commit to this important cause and look forward to working with you all. As members of VCBS, we all have something in common. And that something would be our strong interest in covered bridges - their history, their beauty, their stories, and more. We want to see Vermont’s remaining bridges maintained and preserved, so that generations to come can enjoy them. Thus, the importance of VCBS. Of course, the preservation of these bridges doesn't happen simply because we exist. It takes many groups working together, and it takes the strength and dedication of VCBS. Recruiting new members and keeping existing members as actively involved as possible are two crucial things to the longevity and effectiveness of VCBS. Thank you for being a member of VCBS, faithfully contributing each year to this important cause. And a special thank you to those who are actively involved in whatever capacity they are able to be. All of us banding together truly make a difference. I'd like to extend a hearty welcome to our new members: Lynn Austin and Tim Short of Orwell, Robert Moore and Kris Kelly of Stowe, Patti and David DeLang of Cambridge, Bernie and Rhonda Miller of Waterville, Mark Blanchard of Pittsford, Laura Trieschmaan of Montpelier, Ron Carter and April Tuck of Jeffersonville, and Donald and Margaret Lange of Jeffersonville. The winners will be announced in the spring newsletter. If you are not yet a member, please consider joining us by visiting www.vermontbridges.com. New York State's Covered Bridges - When one typically thinks of covered bridges, New York is not the first state to come to mind, but New York once had over 300 covered bridges. Floods, fires and progress have claimed all but 32. Readers will enjoy seeing NY's current bridges, including the oldest existing covered bridge in the U.S., the Hyde Hall Covered Bridge, located in Glimmerglass State Park, and the world's longest singlespan covered bridge in the world, the Blenheim Covered Bridge, washed away by Tropical Storm Irene in 2011. This book also highlights the Theodore Burr Covered Bridge Resource Center in Oxford, NY, the first ever center of its kind specifically designed for covered bridge researchers. 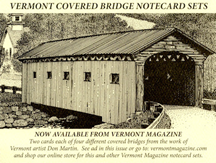 The work of Vermont artist Don Martin is shown in an 8 card set featuring 2 cards each of 4 different covered bridges. The cost is $9.95 for a packet of 8 cards with envelopes, plus $5.00 shipping. Add $1.00 shipping for each additional	packet. (Cards measure 4.5"x 6"). Visit the Vermont magazine online store at www.vermontmagazine.com. Covered Bridges of Vermont Print - The Covered Bridges of Vermont features 19 photographs of covered bridges taken throughout the state by photographer, and VCBS member, Ray Arsenault. The print is beautifully printed on professional high quality 100lb paper, and measures 18" x 26.5". Order now at: www.coveredbridgesofvermont.com.